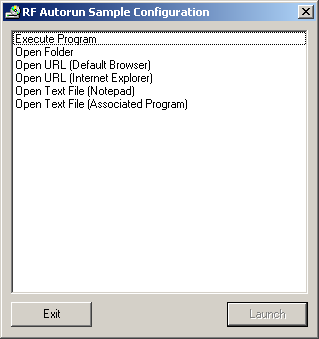 RF Autorun is a simple yet customizable menu, intended to be launched from autorun.inf. It is written in Visual Basic 6.0, and will work out-of-the-box on Windows 98 SE and beyond. It can launch programs (relative, absolute, or path-based), open folders, open URLs, and open documents with associated programs. All configuration is done within autorun.inf itself, meaning only two files are needed on your media, autorun.exe and autorun.inf. All text displayed within RF Autorun (including widgets) is changeable via autorun.inf, providing for crude localization. 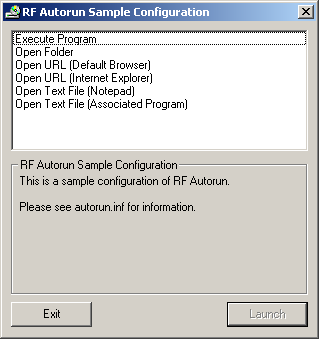 RF Autorun is Free software. Source code is distributed with each release, and is licensed under a 3-clause BSD license. Why Visual Basic 6.0? Why not Visual Basic .NET? RF Autorun was created for a work project to make a DVD that had common software needed to deploy new laptops/workstations (drivers, antivirus, etc). As such, it was intended to be run before Windows Update was run. These were for Windows XP SP1, which would not have .NET runtimes available until Windows Update was run. RF Autorun should be forwards-compatible with Visual Basic .NET, but because of its simplicity, compiling against Visual Basic 6.0 was not an issue. Will RF Autorun work in Windows 95 or Windows 98? What about 64-bit Windows? RF Autorun will work out-of-the-box on Windows 98 SE and beyond, as Windows 98 SE was the first Windows to come pre-installed with Visual Basic 6.0 runtimes. It will work with Windows 95 and Windows 98, but the Visual Basic 6.0 runtimes must be installed beforehand. 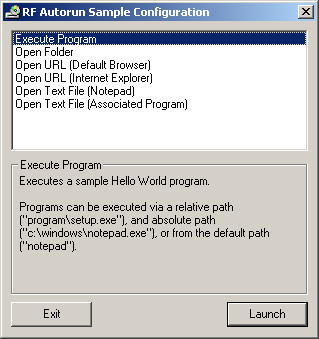 RF Autorun will work on 64-bit Windows systems.